The Corporate Relations Committee of SIMSREE organized its 1st major event of the new academic year, HR conclave on 10th September 2015 to discuss various aspects of leadership and its effect on organizations. 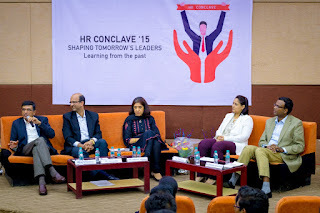 The HR conclave is an annual event where HR heads of reputed companies assemble at SIMSREE to express their views on a topic that has relevance to the current market scenario. 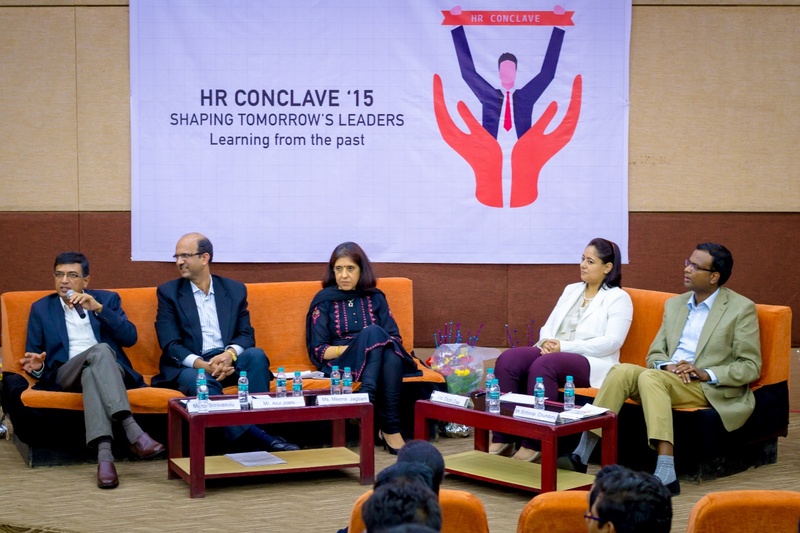 The topic for this year’s HR conclave was “Shaping Tomorrow’s Leaders: Learning from the past”. 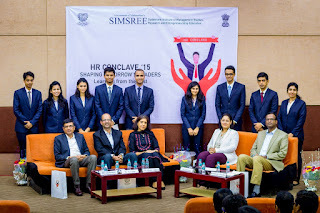 The guests that graced the college campus for this event were: Mr. C Srinivasulu (Vice President - HR, Lupin Limited), Mr. Atul Joshi (Head HR (Automotive Division), Mahindra & Mahindra), Ms. Meena Jagtiani (HR Advisor - Projects, Group Human Resources, Aditya Birla Management Corporation Pvt. Ltd), Ms. Diptii Das (Head HR - South Asia, Aramex International) and Mr. Srinivas Chunduru (Chief Human Resources Officer at the Piramal Group). The panel discussion was moderated by Ms. Jagtiani who gave a brief introduction of the topic to the students. After the introduction, the discussion was started by Mr. Srinivasulu who being a home-grown leader himself, shared his thoughts on how a company can groom its employees through succession planning and leadership identification processes by giving an example of Sundar Pichai. The discussion was followed by Mr. Joshi who gave an insight to the new trend of Gen-Y leaders. Ms. Das who spoke next, made the atmosphere lively with her highly energetic talk on the current volatile world and how a leader who has a hybrid portfolio is best suited for this environment. Mr. Chunduru stressed upon the importance of values like integrity and humility which are essential for any leader in today’s world. The discussion was then concluded by Ms. Jagtiani by expressing her views on the trends of future, loyalty and leaders. The crux of the discussion was whether a company needs a home-grown leader to tackle the challenges arising due to a global and complex environment or a lateral hire who has a vast experience across industries and organizations. The panel unanimously acknowledged that the most significant thing that mattered while electing a leader were his/her innate qualities like humility, general management skills, professional competence etc. though both company loyalists and laterals had a few distinct advantages which made them more suitable than the other in a few instances. The other part of the discussion was on the challenges faced by women leaders in the industry and ways to overcome it. The discussion was followed by a Q&A round for 30 minutes. It was a great and insightful session for the first year students. “The various facets of leadership became very clear to us” quoted one of the students. They also got a chance to understand the expectations and qualities that organizations look for in a leader which is a vital part of corporate life. Thousands of Human Resource Management Projects Report on the following topics for your mba final year projects, mba summer projects, mba thesis, mba dissertation etc.